This blog marks the seventh Intern Alumni Spotlight — a series highlighting some of the individuals who have interned with the Nature Conservancy of Canada (NCC) in the past. Last month, Ryan Dudragne was featured as the Intern Alumni Spotlight, and this month we are following up with Victoria Shore. 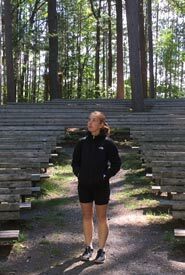 Where she started: Victoria attended the University of Western Ontario, where she completed a bachelor of science degree, double majoring in biology and classical studies. 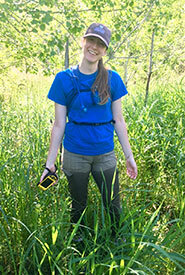 According to her, this odd mix was helpful because “classics helps with the communications side of the job, which is pretty important in the environmental sector.” After finishing her undergraduate degree, she completed a graduate certificate program in ecosystem restoration at Niagara College. After graduating, she worked in contract positions for several non-profit organizations, including NCC, until she landed a job with Fisheries and Oceans Canada. 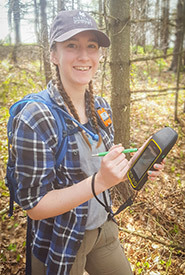 As an intern: Victoria was hired as a conservation technician for NCC’s Central Ontario East region in May 2017. In this role, she did a lot of property stewardship activities, including invasive species management, planting native species and running volunteer events. Victoria also conducted a property inventory for a property that NCC was interested in purchasing at the time, as well as surveying and monitoring many of NCC's properties in the Rice Lake Plains and Napanee Plains areas. Where she is now: Currently, Victoria is a fisheries protection biologist with Fisheries and Oceans Canada. Whenever a project near a body of water could potentially impact fish and their habitat, as determined by a self-assessment on the Fisheries and Oceans Canada website, it must be reviewed by Fisheries and Oceans Canada to ensure that it complies with the Fisheries Act and Species at Risk Act. After reviewing the project plan presented by proponents, Fisheries and Oceans Canada provides advice about best practices, issues authorizations and helps develop offsetting plans. Once approved, Victoria says, we also go back and monitor how the fish are progressing, making sure that no serious harm was done to the fish or their habitat. Where she is going: According to Victoria, she would like to go back to school to complete a master’s degree. She also sees herself going back to working in a position with a restoration and conservation focus rather than a regulatory focus. This could be in the government or at a non-profit organization. The Conservation Internship Program is funded in part by the Government of Canada's Summer Work Experience program.